A series of new interactive flat panel solutions by Chief are now shipping. The new accessories attach to Chief flat panel mounts and convert standard TVs into interactive surfaces. The FCI accessory installs with FUSION Series mounts, and the PACI adds interactivity to Click Connect Series swing arm mounts and mobile displays. The accessories are engineered for simple installation with a design similar to Chief side speaker adapters. 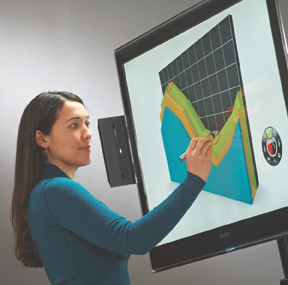 The solution is designed to transform a flat screen display into an interactive platform powered by eBeam technology from Luidia Inc.
Each interactive solution includes a stylus featuring real-time rendering capabilities. The accessory works with 40-55" LED-backlit LCD displays with a rigid front panel. To install the system, users can add the accessory to the mount, install the interactive software and connect a PC or Mac to the receiver via USB. The universal compatibility of Chief mounts provides users the ability to upgrade a flat screen at any time without having to pay for interactive capabilities all over again. "Customers have expressed excitement about the simplicity of converting a select flat panel into an interactive display, the intuitiveness of the software, and the ability to share a common platform," said Derek Derks, Chief’s business development manager. "I’m most excited about the possibilities for our partners to create interactive meeting and training spaces that are accessible for everyone."